The Fellowship was fortunate enough to obtain a copy of WARHAMMER 40K: DAWN OF WAR #1 from Titan Comics. Ryan O’Sullivan writes, Daniel Indro draws, Kevin Enhart colors, and Rob Steen letters. The Master of the Chapter has disappeared. He is the heart and soul of the order, and he must not be left behind on this planet, festering with orks. Two sergeants, Olivarr and Tarkus, volunteer to lead the rescue mission. After a rough landing, the marines discover that the Master claimed to hear voices when he left, calling him toward a catacomb nearby. Never-ending war is the only business of these marines, and business is good on this planet. In a religious order like theirs, things are often treated as simple when they may be much more complex. These characters seem very simple on the surface, but I think we’ll learn a lot about them in this story arc. And the art takes a war-torn world to a whole new level. This is a cool war story all by itself, but it’s also a tie-in to the upcoming new video game of the same name. It could be fun to check out both. 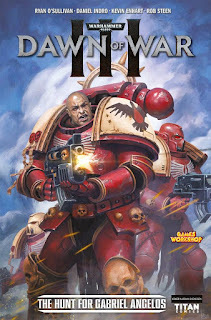 WARHAMMER 40K: DAWN OF WAR #1 is available now from your local comic shop, or online at titan-comics.com.